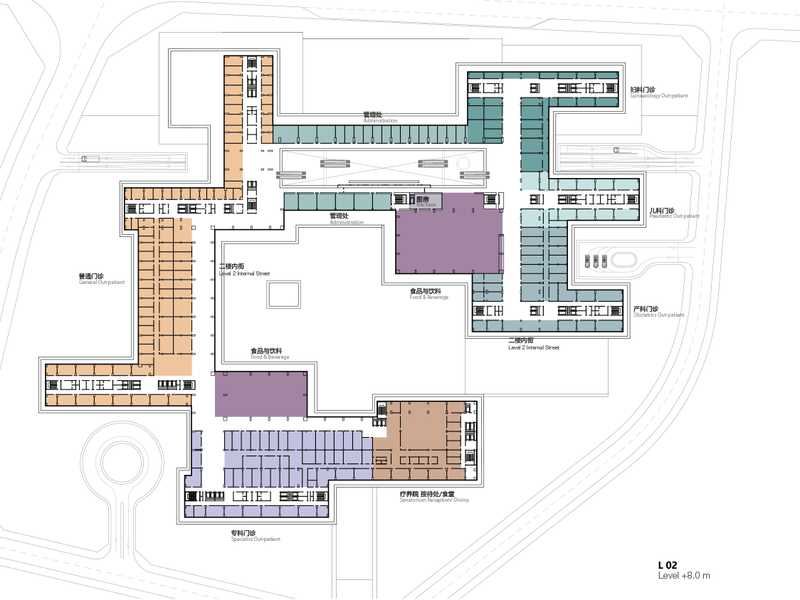 500 bed Women’s and children’s hospital, 1500 bed general regional hospital, including restaurants, retail, elderly care centre. 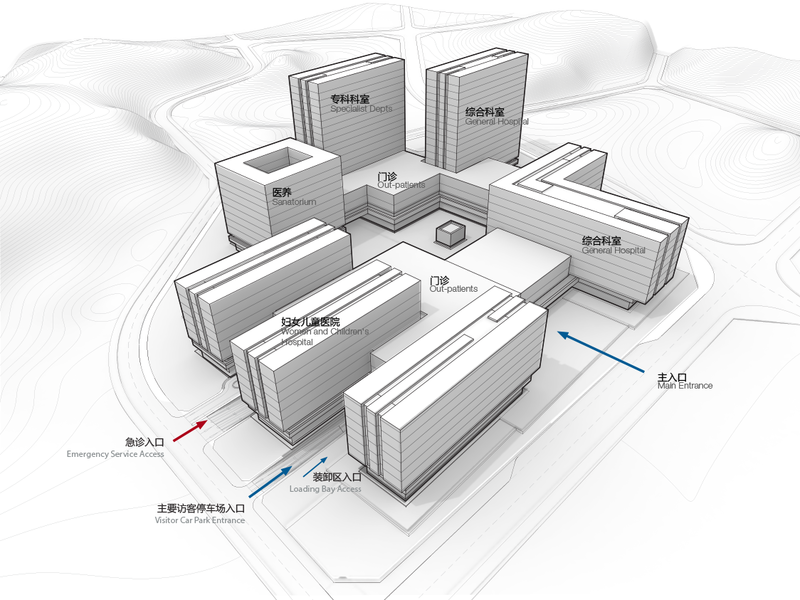 Conceptual design for a new private hospital for Women and Children in Zigong, Sichuan province, later to be expanded into a 2000 bed general regional hospital. 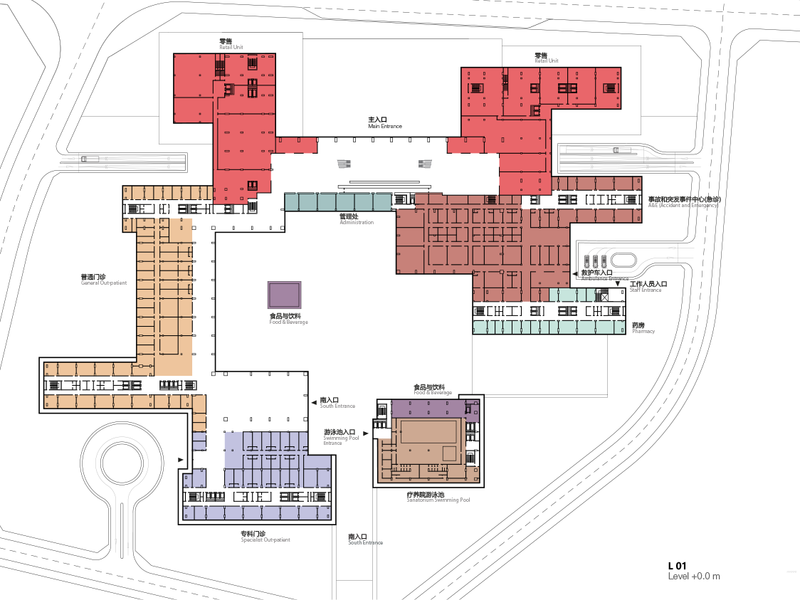 The design of the hospital complex is developed in accordance with the latest planning and design requirements, to ensure that the separate functions of emergency care, health care, teaching, research, preventive care and rehabilitation can all operate efficiently, independently and also in symbiosis. 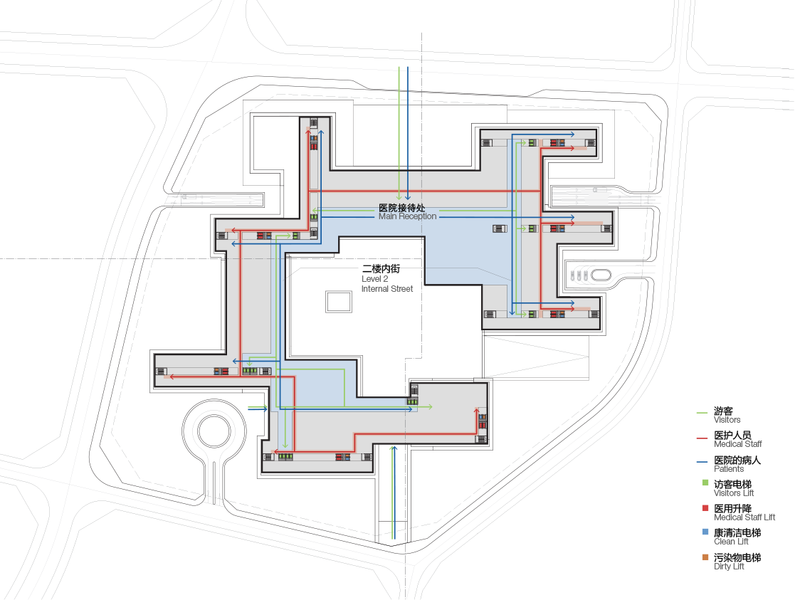 The design is generated around the circulation diagrams of different user groups (patients, visitors and staff) and the complex logistics involved in the smooth and safe running of a hospital complex. 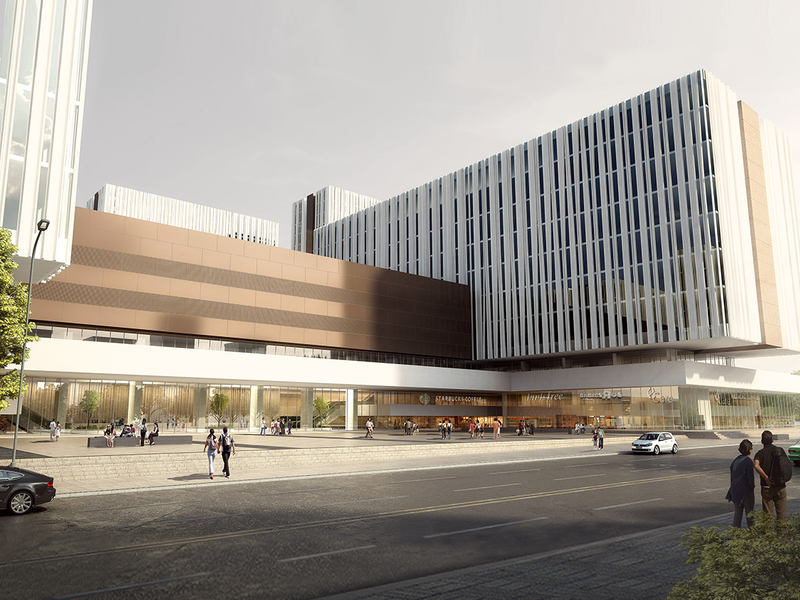 Central to the design is the idea of a ‘patient centered service of the highest quality’, conceiving the institution as a five star hotel with personalised service, small scale wards and private rooms. 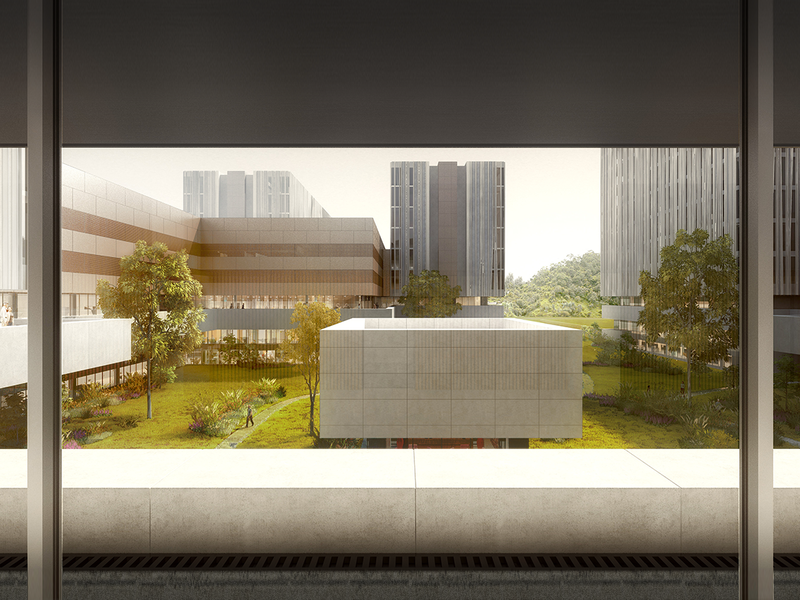 The main circulation system is conceived as an ‘internal street’ which receives natural light and has views to a large, landscaped courtyard. 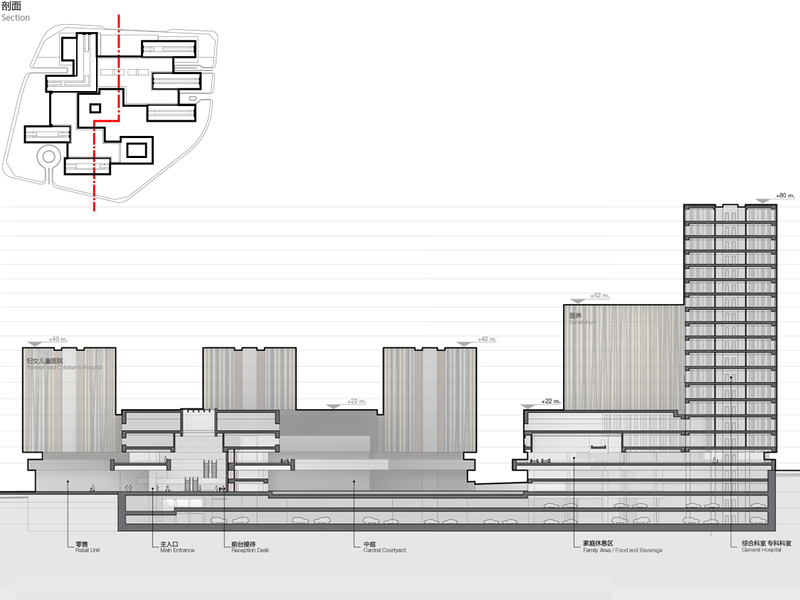 The architectural building massing is firstly defined at an urban scale. 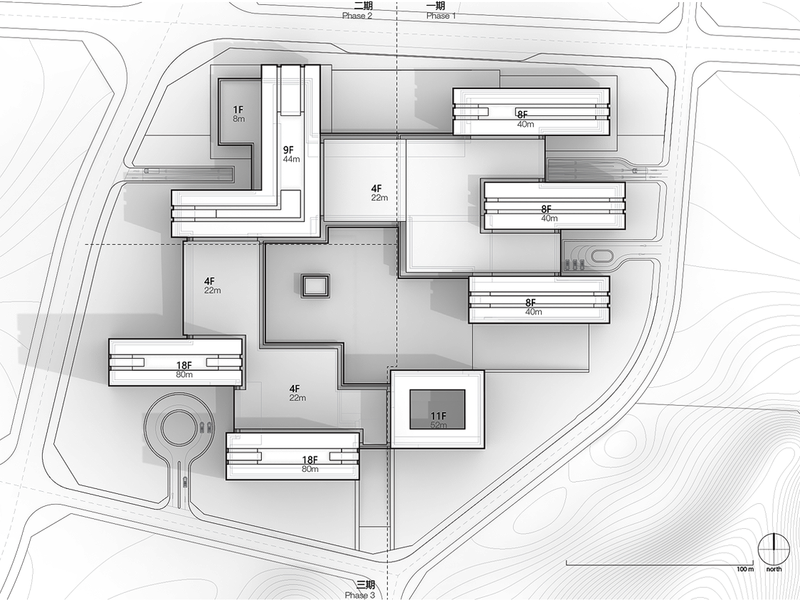 One of the key aspects of the organisational layout is the balance between separation and connectivity- the logistics of the hospital require a compact building while patient comfort is increased by the separation of separate wings. 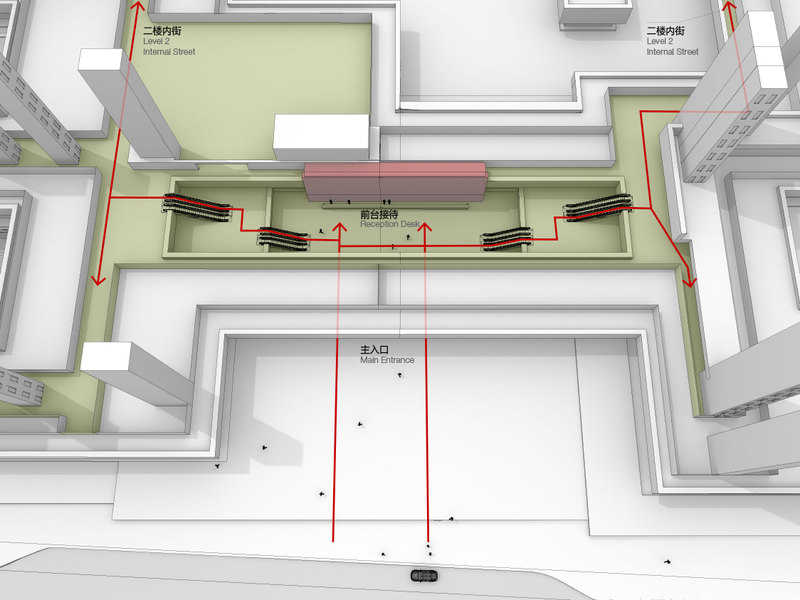 Learning from the typologies studies and historical and current developments of hospital buildings around the world, we proposed an adaptation of the established and proven model of the ‘comb’ layout – having separate wings connected by a central corridor. 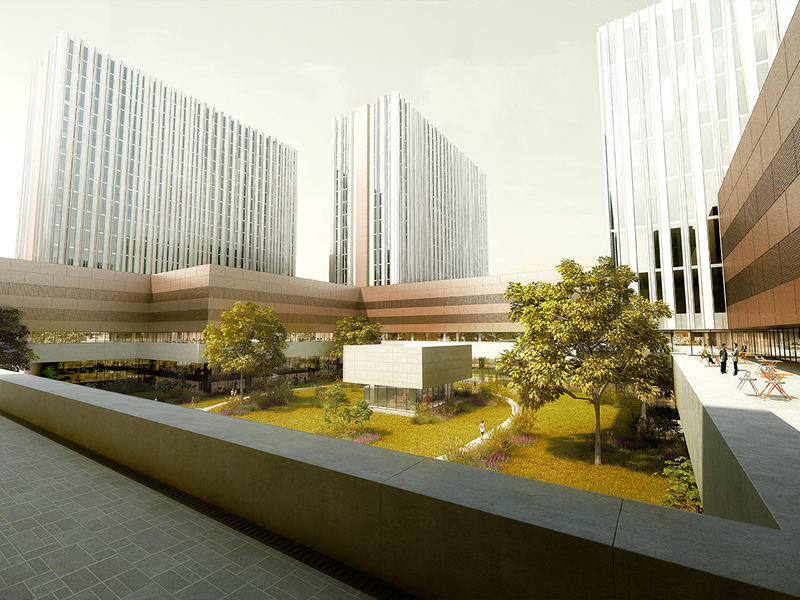 Following the requirements to be able to construct the overall complex in three separate phases, the central corridor was arranged in a ‘ring’ configuration around the site, leaving a central courtyard space to separate the different buildings and allow all patient rooms to have close contact with nature. 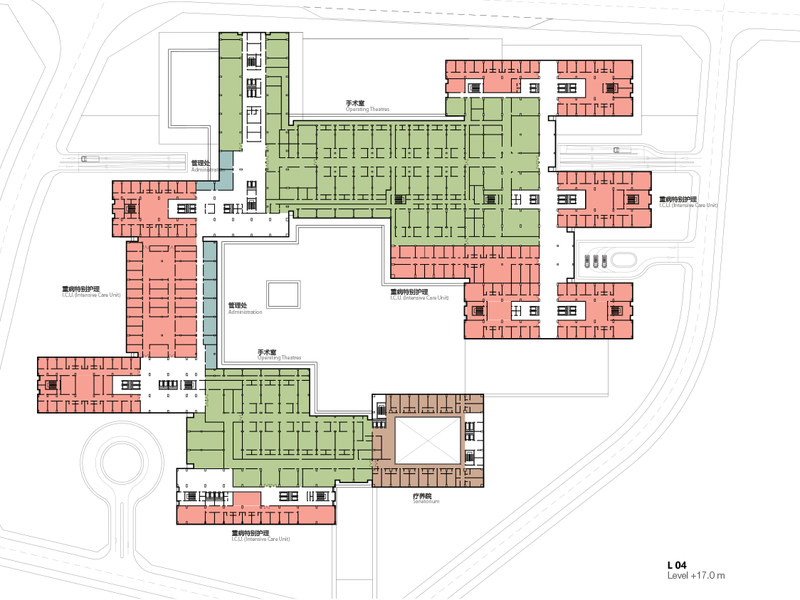 Underneath the courtyard are logistical services such as kitchens, laundry and storage facilities that are expanded when new phases are added but work in a centralised manner at each stage of construction. 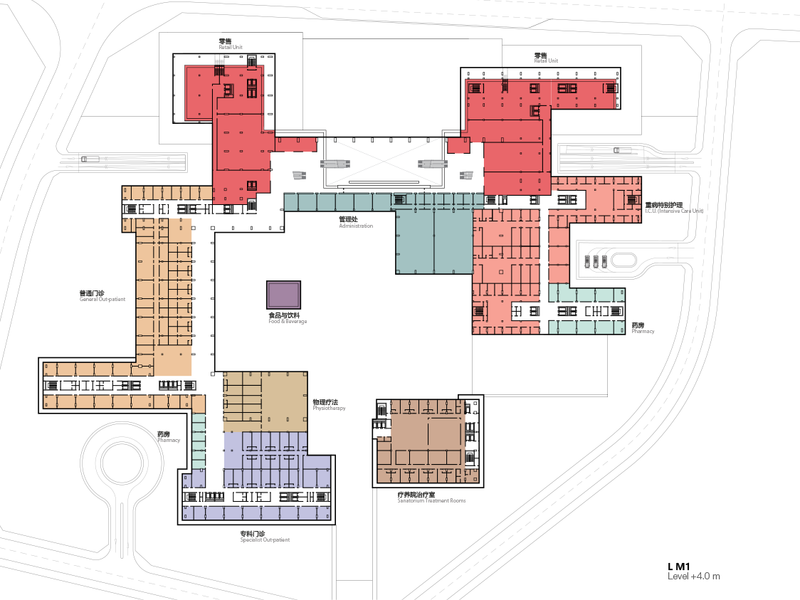 The key organising elements on the ground floor are the main entrance and connected retail programs, and the accident and emergency department and related services. 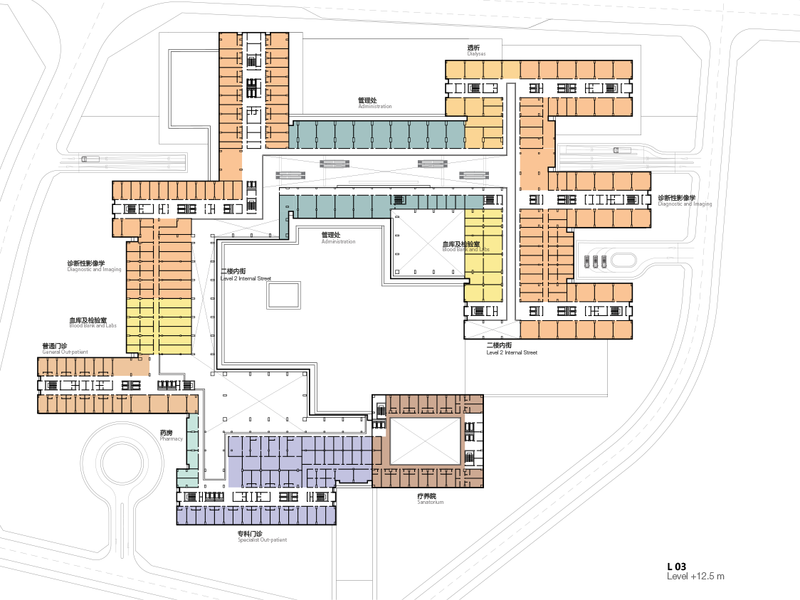 Due to the size of the emergency care department, the internal street is raised to Level 2 where it can circle the entire site and visitors can access all of the different outpatient areas and lift cores to inpatient departments for visits to relatives. 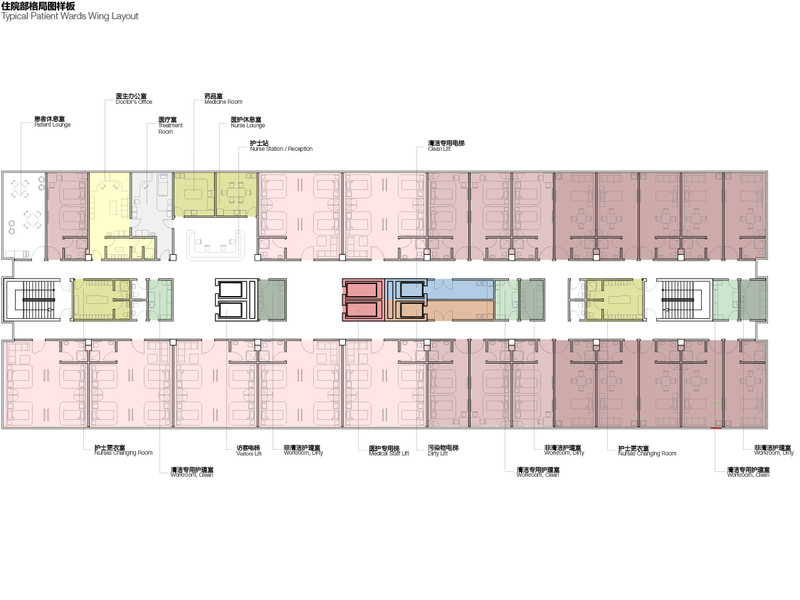 The internal street has a simple and logical layout to guide navigation and features double height spaces, restaurants, family areas and seating. 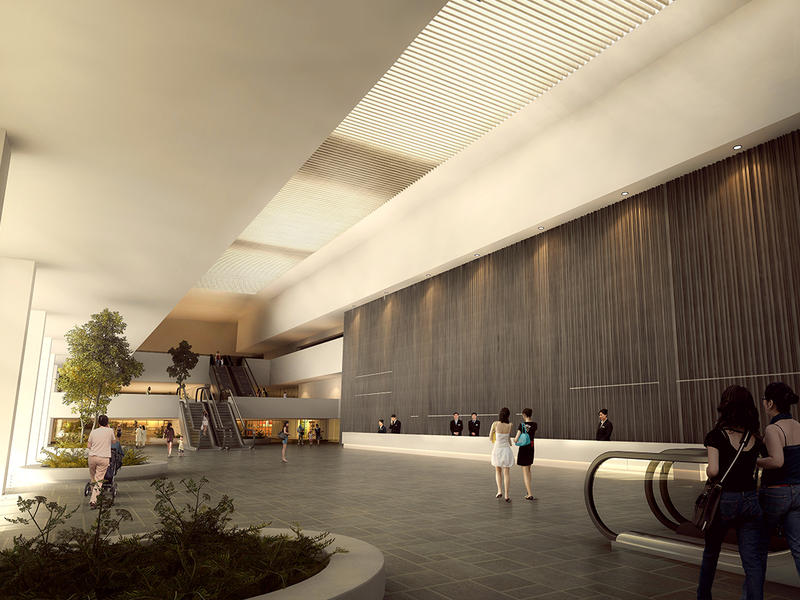 It is accessed from the grand entrance lobby that features a spectacular atrium illuminated by natural light. 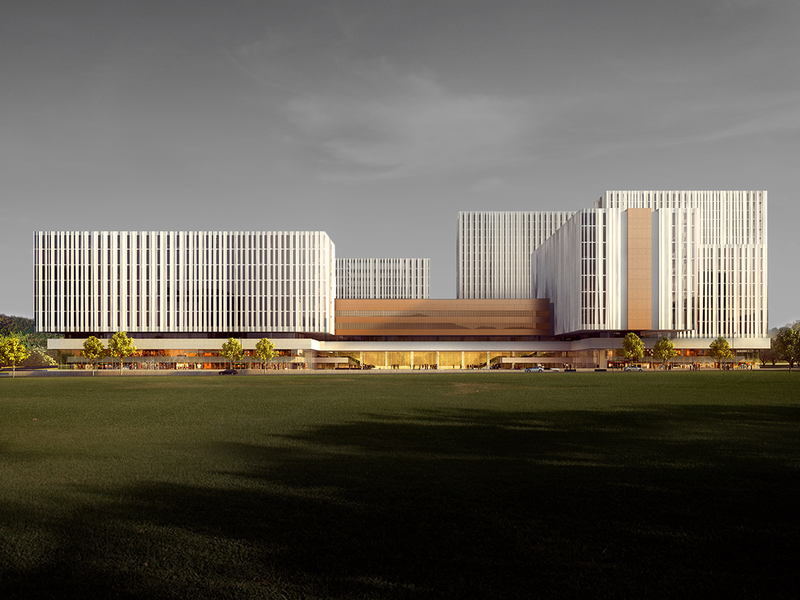 The facade system is one of the most important aspects of the design as it projects the image and reputation of the hospital as a high quality care facility to the outside world. 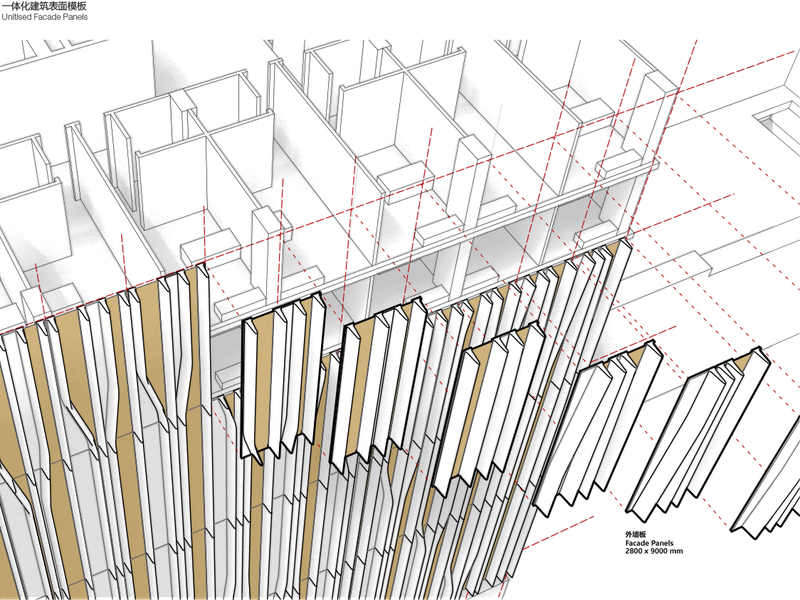 A unitized curtain wall is proposed as it not only offers improves the quality of the building, but also significantly streamlines the construction process. A modular system can be prefabricated in the factory and installed as double floor height panels of 2.8 x 9 meter (based on the floor to floor height of the building of 4.5 m and the column grid distance of 8.4 m), the maximum size that can be easily transported by truck. 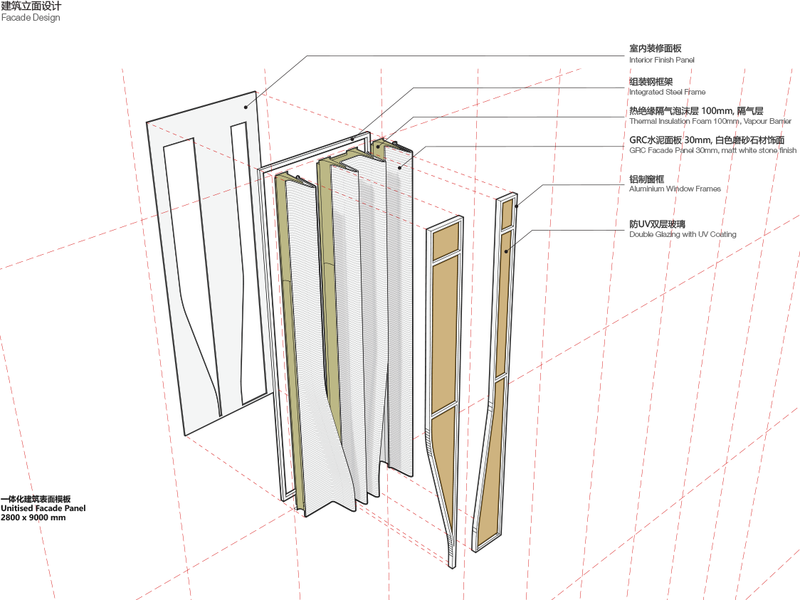 By introducing a small number of different panels, the system can form patterns of varied density in an economical way. 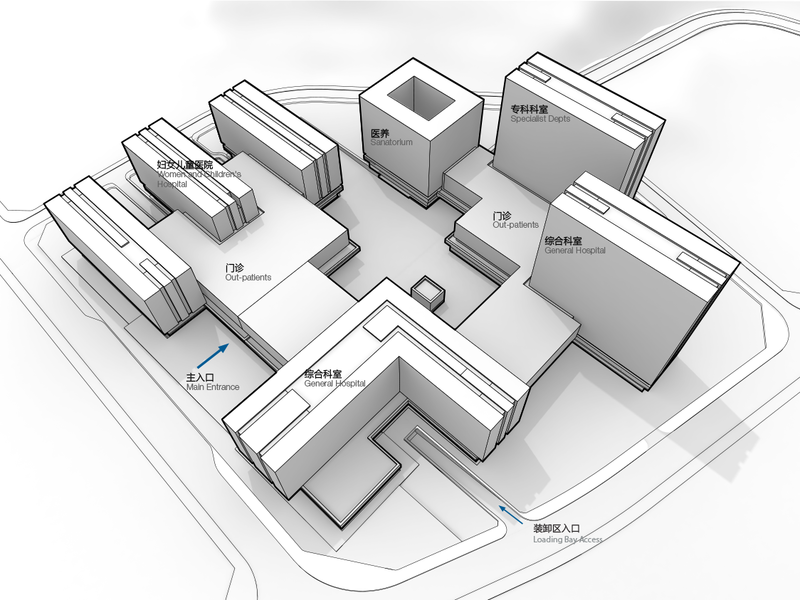 The hospital buildings are arranged around intelligent, automated, centralized processes, as well as medical procedures at the highest professional standards. 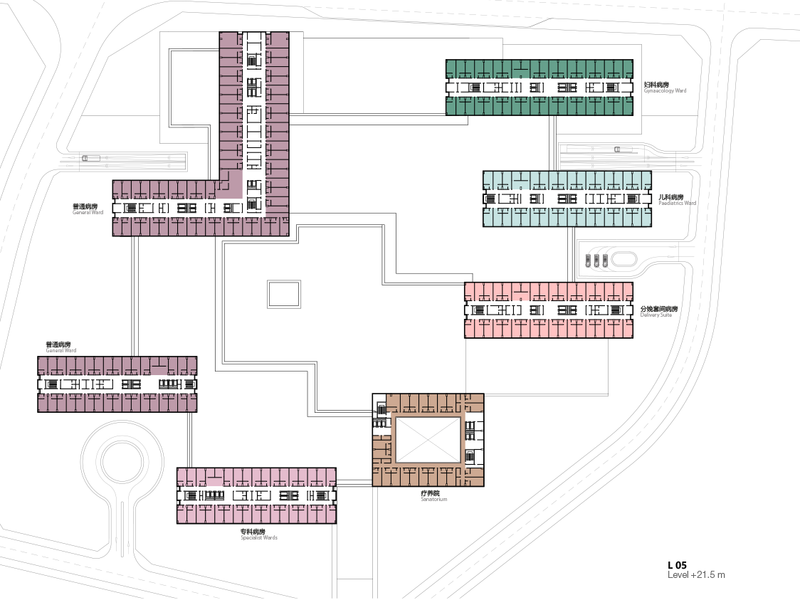 The building layout aims to achieve the greatest degree of resource sharing, optimising internal circulation and reducing the impact of logistics on the patient. 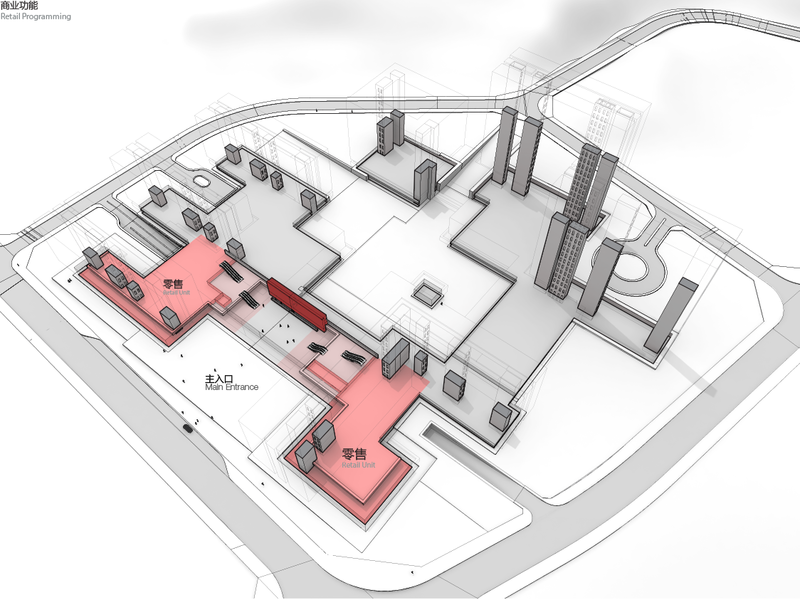 The use of the buildings have great adaptability and flexibility, with each functional area being relatively independent, but also forming a coherent whole to facilitate unified management. A universal construction grid and flexible partitions allow for easy adaptation of the internal layout to future changes in demand of particular services or the introduction of new medical practices and technologies. The design adheres to the principles of sustainable development, paying attention to ecological design and energy-efficiency, the impact on its context and the rational use of resources. 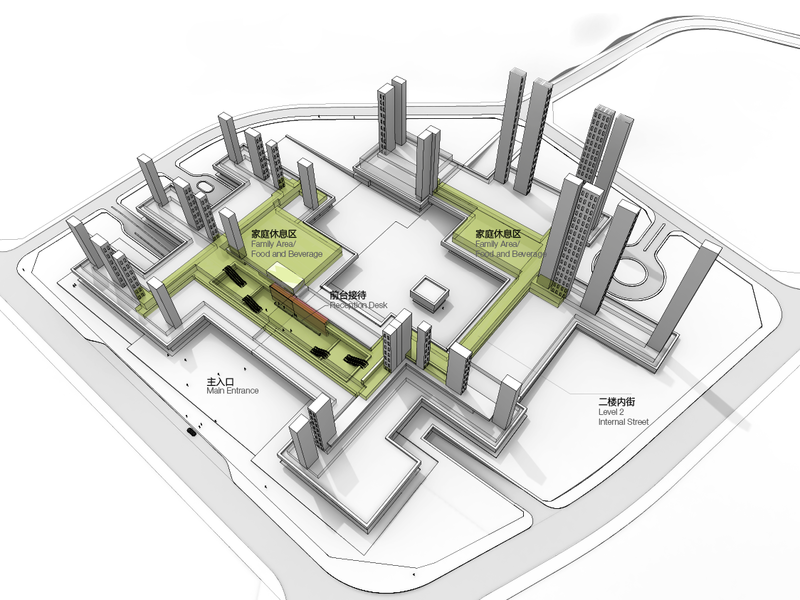 The buildings feature a compact layout, emphasizing land conservation and the efficient and flexible performance of their internal processes. The architecture and the spaces are designed around people, creating a comfortable and pleasant environment. 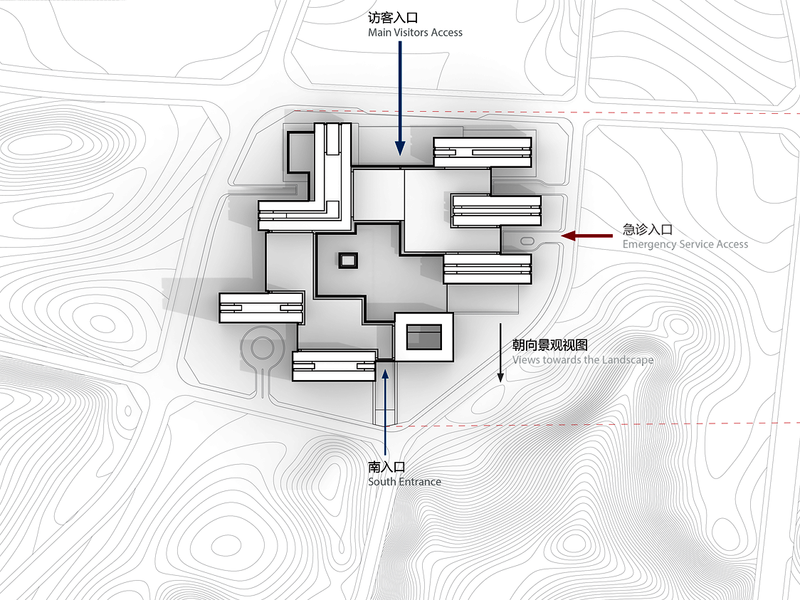 The circulation design is based on human activity spaces and flow lines, using a sense of scale and close contact with nature to match the physical and psychological needs of people. The patient areas are designed to offer privacy and other aspects of respectful, humane care throughout the full range of services. 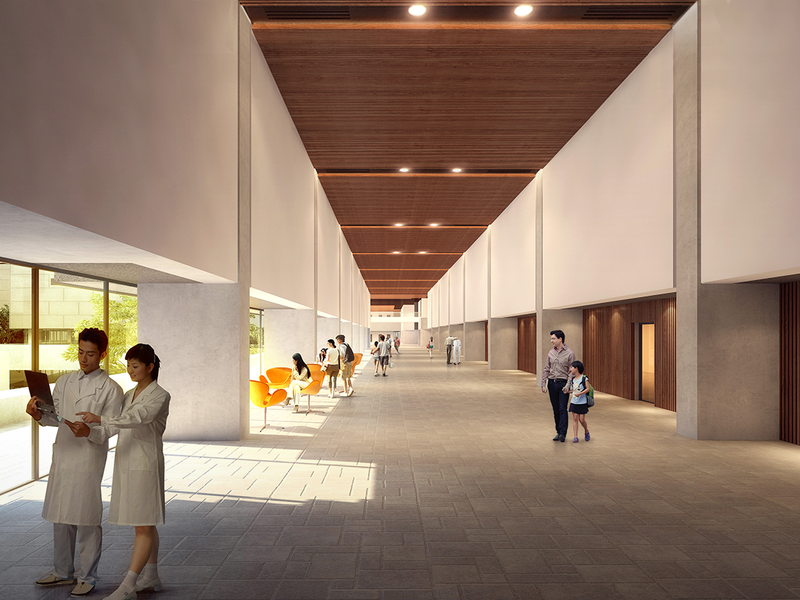 In line with current practice of ‘evidence based design’, a specific palette of natural materials and colours, lighting and furniture are recommended that are proven to help improve patient recovery. Patients are offered a range of choices to communicate and interact with other patients and/or visitors which is proven to help alleviate the suffering of distress or psychological pressure, and contributes to the rehabilitation. Rooms have comfortable furniture for visitors to spend time with patients and some rooms allow for partners to stay overnight. Particular attention is paid to the delivery suites in the maternity wing which has the best views to the surrounding landscape and allows family members to visit and be part of the birth process. 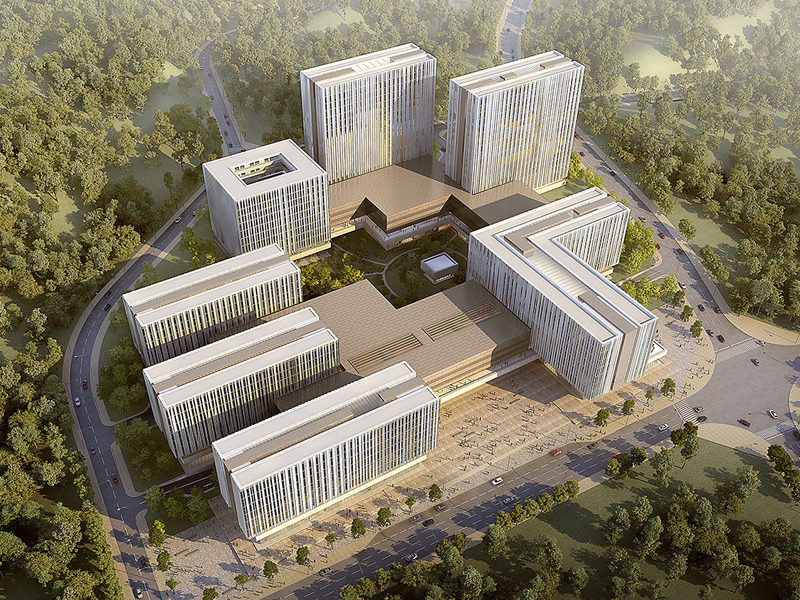 A number of ‘wellness’ programs is proposed for the hospital complex to benefit patients and visitors, including a spa and pool area, cinema auditorium, art gallery, high end restaurant and garden with tea pavilion.